In around 1994, our USA representative requested a pliers-type multi-tool from us. We declined as we did not want to copy the inventors of this product innovation. However, as increasing numbers of manufacturers were starting to produce pliers-type multi-tools, we made up some prototypes. They functioned differently and contained a number of patented improvements which did not require the pliers to be opened in order to access the other tools. When experts all over the world refer to the Victorinox SwissTool as the «best of the best», «a bullseye», «the Rolls Royce of all tools», or a «cult tool», that's not just by chance. The Victorinox SwissTool was launched in 1997. The SwissTool plier is not soft and it is at 53 for a reason. Other multi-tool pliers are known to break. The SwissTool plier is balanced and it does not bend or break. The correct combination that is. More than 90 % of everything on the SwissTools are made in the Victorinox facility in Ibach. This is proably a milestone in itself. I do not know many manufacturers today that can say the same with multi-tools. There are six main modification on the SwissTools and plier in history. There are also some more variations to be found on the cutting area on the pliers as well. On the picture to the right are the evolution on the plier heads. Have in mind that the 2001 type are also referred to as the 1999 type! Picture borrowed from Victorinox.CH. I have the 1998, 2002 and 2005 types, Please see my pages. On the 1998 type plier there is a section with a slot for the area, do not be surprised if you find a 1998 without this slot section. The Victorinox constant quality improving is a factor that people must have in mind always. This is the reason for modifications and evolution. On the picture you can see a detail that is interesting. On the left model with a 2002 plier got when the plier is fully out the plier tang design follow the shape of the modul design. Not sure if this changed on the 1999/2001 type first. It is interesting! In the history of military equipment the use of pliers in many forms are not rare. 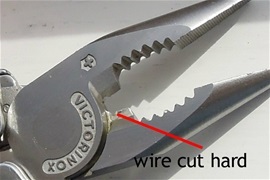 The combination knives and other tools with the pliers can be found and documented on the internet. It is common knowledge that this is a tactical choice for a huge selection of tasks for military use. A multi-tool gives the advantage with having everything in one package. This is a bit depending on the size and strength of the plier. Some have doubts and go for the old way with a separate combination plier with the tree main tools for all uses. There are different quality ones today, there are an incredible selection to choose from really. One of the advantages with this is that it is easier to clean and you automatically get the extra advantage with having the possibility for two hand use. That can be a screwdriver in one hand and using the plier to hold in the other. There is a chessboard of possible uses. The negative with this is the carry, how both tools can be secure in the carry systems. The biggest advantage is that you can use a strong plier that is bigger and can take more than a Multi-tool plier can take. You can get cutting abilities that is faster, more secure and durable. It is very difficult and it is very expensive to make pliers in Multi-tools that can compare to larger tools. Today you can find interchangeable cuttting inserts. This is a very nice thing in my mind. It is difficult to make a Multi-tool that can replace professional crafts tools. Actually it is far more difficult to make a plier that can replace a craftsman need than the individual screwdrivers, functions and knives. Somehow the plier always takes more beating and wear. It is many times a misunderstanding that a Multi-tool can replace and be used for everything. No matter on how strong the steel and quality is. It is very dependent on precision. I love everything to do with Multi-tools like you know, it is a great invention. Today it is usually the slim needle-nose pliers that are the favorite choice among people. It is not so always that large size separate pliers are the best, they can also break and sometimes they do not take more abuse than the Multi-tools ones. For sure there are separate craftsmen pliers today that got a quality that is much better than the Multi-Tool ones. Another advantage with separate pliers is the use of insulating handles against cold and electricity. You can get a better and safer grip. Swiss Army Knives are excellent to be used in combination with a separate plier. It is a combination that can be used just as well in the everyday life as for survivalists and safety experts.